The United States in the 1970s and 1980s witnessed a rapid broadening of interest in the cuisines of Asia, as China re-opened a few doors to the West, and Indian restaurants popped up even in such remote outposts as Eugene and Seattle. Living in Portland in the early 1970s, I trekked to Seattle to visit friends, friends who insisted that not only did I need to see Wagner’s Siegfried, but that I must also go with them to India House and there sprinkle raisins and peanuts and cucumber snips over my meal, all of which was terribly exotic. A few years later in Jacksonville, Oregon, after reading in the San Francisco Chronicle about the fiery hot dishes to be had at the Hunan Café on Kearny Street, I made my way there on a Greyhound bus and almost fainted (happily) as sweat dripped onto my plate. New foods were exciting, hot in more ways than one. That era also brought to the Pacific Northwest the men and women in red, the followers of Bhagwan Shree Rajneesh. I’m inclined to characterize the Rajneeshi in Oregon as reasonably well-educated, well-to-do young men and women attracted to a quasi-religious sect that encouraged material well-being and sensual romping; I won’t get into their dark side, which included paranoia and bioterrorism. 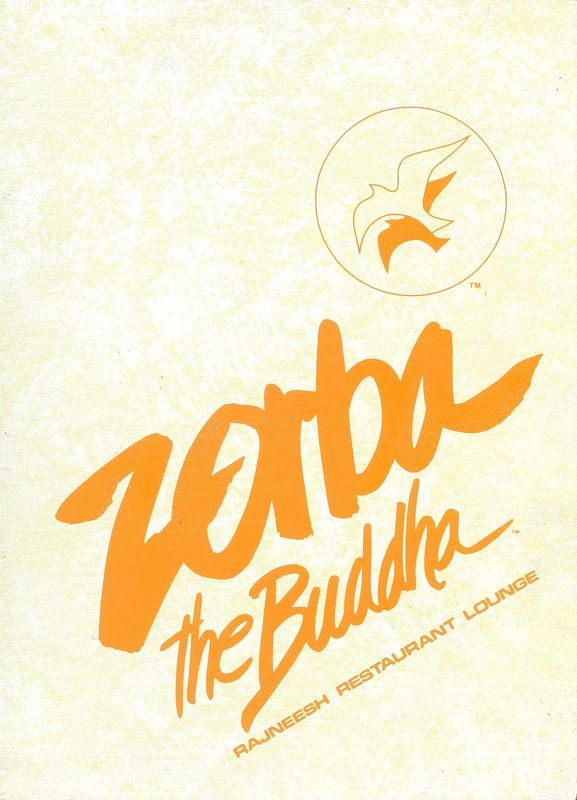 Among the group’s many communal enterprises were a number of restaurants, all of them vegetarian and all of them named Zorba the Buddha. There were Zorba the Buddha eateries in Denmark, England, Germany, Switzerland, Italy, New Zealand, Australia, India—and in Oregon. 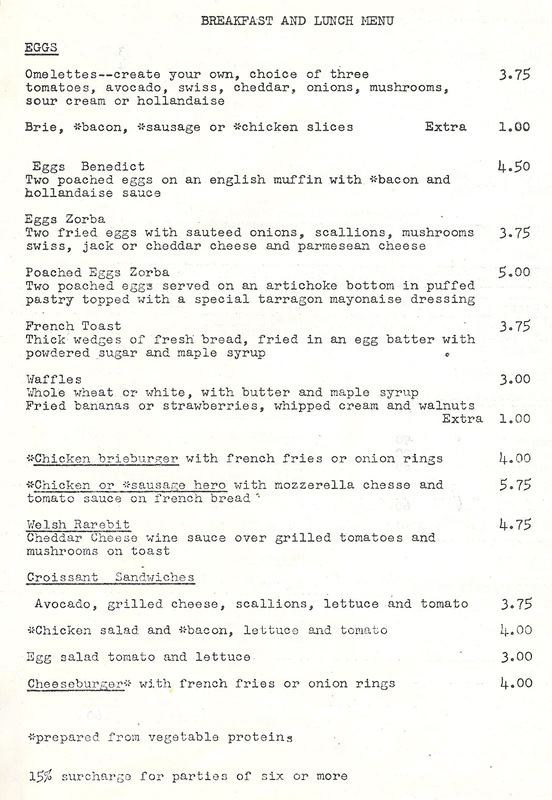 I recently acquired a menu from the early 1980s, which showed five Oregon locations: three in Portland, one in Rajneeshpuram (their compound/city on what had been the Big Muddy Ranch in Central Oregon), and one in Antelope, the small town that briefly, and almost forcibly, was renamed Rajneesh. 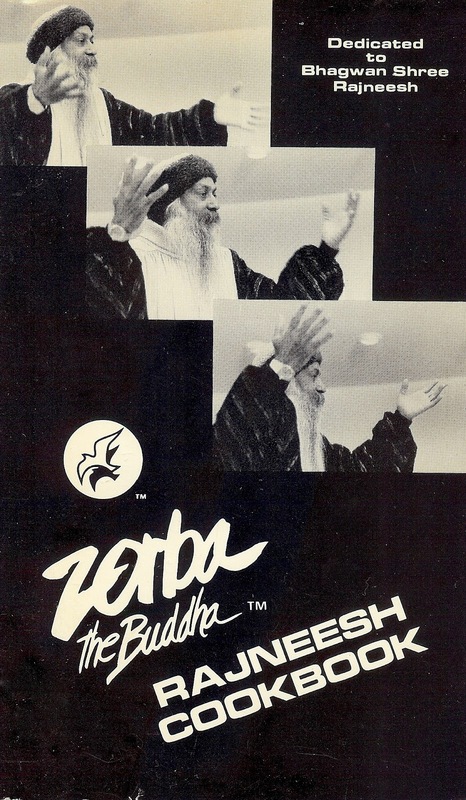 And a few days ago, at an estate sale I found a copy of Zorba The Buddha Rajneesh Cookbook, published in Rajneeshpuram in 1984. For an international quasi-religious movement that spanned the globe, the Rajneeshi appeared to promote a rather mundane diet. Mundane, yet with some faintly odd items, at least as shown in the Oregon menu. Consider, for example, Welsh rarebit. Popular very early in the 20thcentury, rarebit here is a distinct throwback, but with some quirks. The substitution of wine for the usual beer and the addition of mushrooms set this item apart. Melt the butter. Stir in white flour and cook several minutes. Whisk in the beer slowly and add the remaining ingredients. If onions are desired, sauté them in butter until they are brown and sweet. Saute mushrooms and tomatoes for several minutes in butter until mushrooms are soft. Put vegetables on top of toast. Ladle sauce on generously and sprinkle with parsley.